A useful utility for astrophotographers wanting to temporary mark a star on their laptop screen. It displays a red cross on a transparent window. Due to temperature changes fast telescopes must be frequently refocused during an astrophotography session at night. That means each time the scope needs refocusing you must interrupt your exposure series in order to find a bright star outside the FOV, refocus the scope and finally return back to the original FOV. Place the cross on a star in the FOV by using your computer mouse, so you can remember the exact position of the star on the screen. Do not move the cross (i.e. the application window)! Leave the FOV by using the control box of your telescope mount in order to find a bright star for refocussing. Refocus the scope e.g. by using a Hartmann Mask. 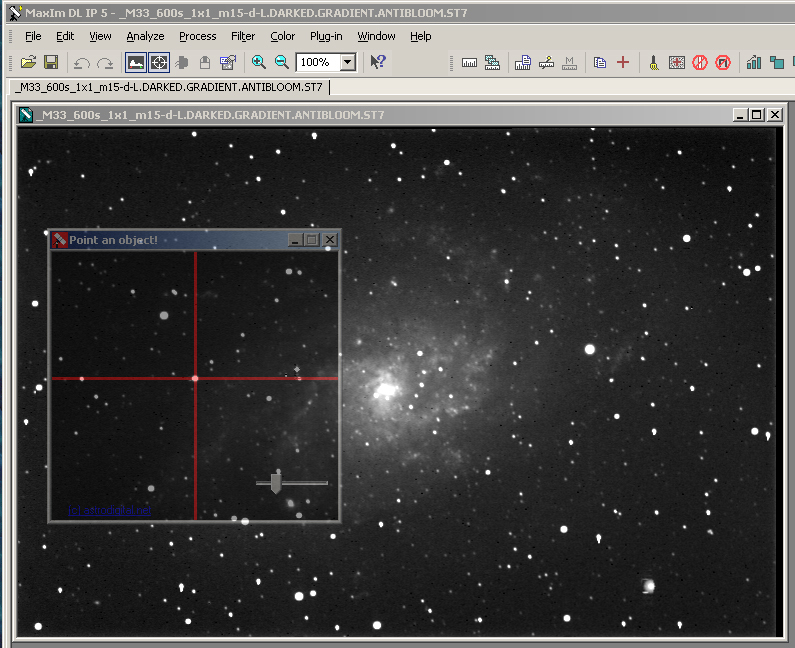 After refocussing it return back to the original FOV and place the star in the cross by using the control box of your telescope mount. Every released version of “Point An Object for Windows" has been checked with the latest antivirus software. “Point An Object for Windows" is freeware and it is distributed as a single executable (.exe) file. If you find it useful, you are encouraged to link AstroDigital.Net from your astronomy homepage. Thank you. - Download and install the .NET-2.0 framework on your Windows-XP computer. If you have Windows-7 or Windows-Vista omit this step. - Download the “Point An Object” and save it anywhere you want. The software “Point An Object” is Copyright (c) 2010 by Panagiotis Xipteras. NO WARRANTY. You use “Point An Object” at your own risk.